Enterprise analytics is quickly evolving into a democratized capability where anyone can access and act on all available information, often in real-time employing advanced techniques. But the complex, dynamic and urgent nature of modern data analytics demands a new approach to data integration. This paper proposes that DataOps, the application of DevOps practices to data analytics, is the best way to overcome these challenges to create an iterative build-operate process for data movement. Understand how modern data analytics create data integration challenges due to architectural complexity, operational blindness and data drift. Learn how DevOps pillars of automation and monitoring can create higher developer productivity, operational efficiency and business confidence in data. 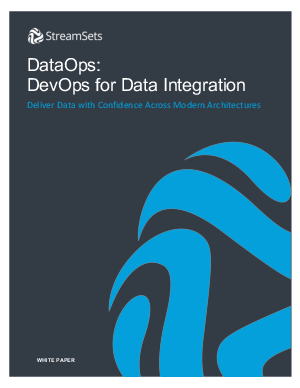 See specific examples of DataOps functionality being applied to data integration across modern architectures.